In cooperation with the academies’ project “Energy Systems of the Future” (ESYS) the HUMBOLDT VIADRINA Governance Platform carries out Trialogs for the working groups of the ESYS project. Experts in the working groups develop interdisciplinary analyses and position papers for the implementation of a secure, affordable and sustainable energy transition. To include also positions and interests of societal stakeholders, the working groups of ESYS exchange views with them in various dialog formats. One of these dialog formats are the Trialogs organized by the HUMBOLDT-VIADRINA Governance Platform. 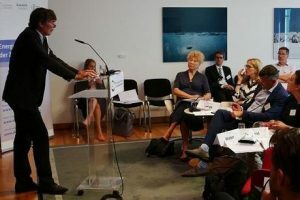 The Trialogs facilitate an intense discussion based on substantiated arguments between the experts of the ESYS-working groups and stakeholders from the public sector, the business sector and organized civil society. By integrating societal and scientific knowledge a broad knowledge base can be established, which allows to identify potential conflicts between stakeholder groups, barriers to the discussion and the general societal sentiments on the topic. The results of the Trialog discussion are to be considered by the working group when compiling the final analyses and position papers. In the first project phase three Trialogs dealing with specific topics of the ESYS project were carried out. For the second project phase until 2019 another eight Trialogs are scheduled. The project is funded by the Federal Ministry for Education and Research. The Trialog took place on October 23, 2018 in Berlin. 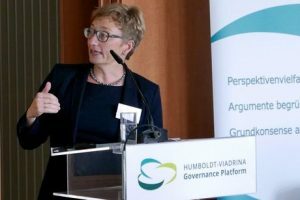 It was the 10th Trialog of the HUMBOLDT-VIADRINA Governance Platform in cooperation with the academies’ project “Energy Systems of the Future”. The energy system is becoming more and more decentralized in many areas. In addition to the few hundred power plants that have supplied Germany earlier, many small producers have now emerged. Whether photovoltaic roof systems or wind turbines – the producers are mostly cooperatives or private individuals, so-called “prosumers”. Many see this change as a new opportunity for participation in the energy system; others point to the higher cost of a more decentralized energy system. Experts from the academy project “Energy Systems of the Future (ESYS)” discussed together with stakeholders from politics and administration, business and organized civil society what our energy system should look like in 2050 and how further developments of the energy system in a decentralized or centralized direction can be evaluated – with regard to total costs, acceptance or jobs. 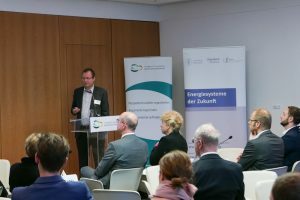 The ninth Trialog on the energy transition in cooperation with ESYS took place on May 28, 2018, 9:00-17:00 hrs, at the Allianz Forum Berlin and was hosted by the Humboldt-Viadrina Governance Platform. A press release is available here (only in German). Biomass is currently contributing more to the supply of energy in Germany than all other renewable energy sources together and is used in the heat and electricity sector as well as for fuel production. Many studies suggest that an energy transition without bioenergy would become much more difficult and expensive, as bioenergy can replace fossil fuels. However, against the potential to contribute to climate protection must be set the risks due to undesired side effects of using bioenergy. If sustainability criteria are ignored, the cultivation of energy crops can cause greenhouse gases, may have a negative impact on biodiversity and soil quality and pollute the water. The contribution of bioenergy to the future energy supply in Germany and the role of bioenergy with carbon dioxide capture and storage (CCS) for climate protection was discussed by experts of the academy project “Energy Systems of the Future” together with stakeholders from politics and administration, business and organized civil society in the Trialog on the Energiewende, organized by the Humboldt-Viadrina Governance Platform. 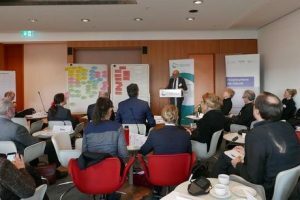 The full-day dialogue event took place on February 23, 2018 in the Allianz Forum Berlin. 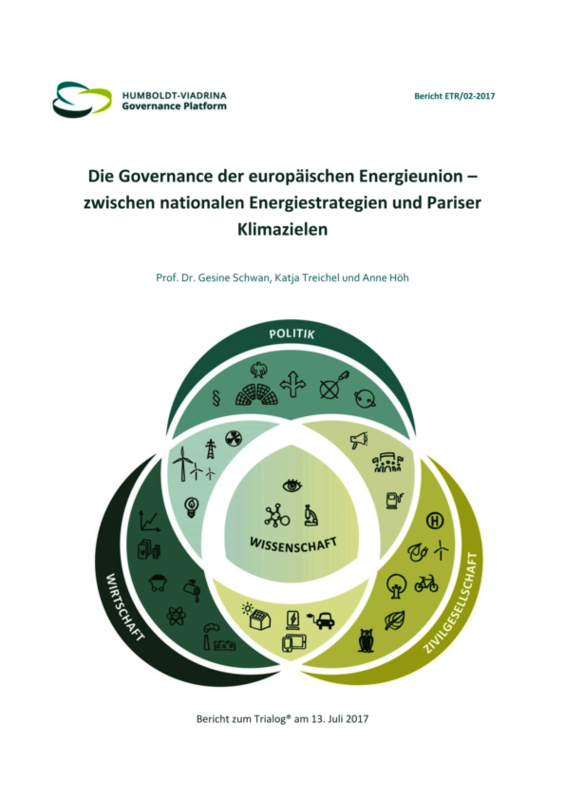 The Trialog report is available here (only in German). The energy system is becoming more and more networked and digital. In addition to opportunities, this also entails risks. 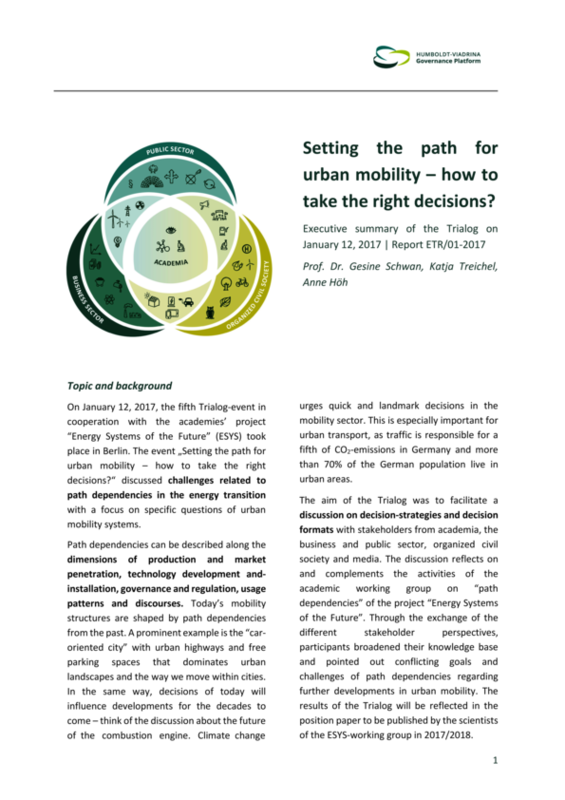 How fast must the digital energy transition be driven to make good use of opportunities and prevent risks? How can critical energy infrastructures be redesigned to create a safe and smart energy system? Who should be involved and what new responsibilities arise? 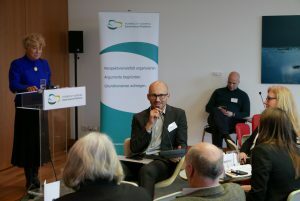 Experts from the academy project “Energy Systems of the Future” discussed this topic together with stakeholders from politics, administration, business and organized civil society at the Trialog on the energy transition organized by the Humboldt-Viadrina Governance Platform. 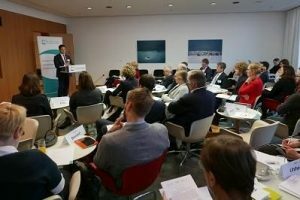 The dialogue event took place on December 14, 2017 in the Allianz Forum Berlin. You can find the press release here (only in German). The Trialog report (in German) is available here. With the Agenda 2030 and the Paris Climate Agreement, two important international sustainability and climate protection agreements were adopted in 2015. Main targets are to limit global warming to well below 2°C in the long run and to achieve a greenhouse-gas neutral world in the second half of the century. Germany and the European Union ratified the Paris Agreement. In order to implement it, the European energy supply has to be transformed in a joint approach. But conflicts within the European Union and between member states may hamper the implementation, for example if some European member states continue to rely on fossil fuels in the long run. Does the European Commission have enough competences in the field of energy policy to steer the transition process and reach the climate targets? Are the instruments and procedures foreseen in the “Clean Energy Package for All Europeans” (winter package) suitable and how can a fair distribution of responsibilities be organized? A newly set-up working groups within the project “Energy Systems of the Future” (ESYS) deals with these and other questions regarding the governance proposal. In the Trialog “The Governance of the Energy Union – between national energy strategies and the Paris climate targets” on July 13, 2017 experts from the ESYS project exchanged ideas and perspectives with representatives from the public sector, business sector and organized civil society. A press release is availabe here (in German only). People move within cities, and goods need to be transported from A to B. But most cars and lorries in our cities emit substances that harm our health and the environment. To reduce the emissions, we can rely on a range of options and alternatives. How will we move within cities in the future? What is the role of new technologies? And how can we set a path for a low-carbon urban mobility while facing a number of uncertainties? Decisions we take today determine developments of the mobility sector for the decades to come. If a certain path is chosen and certain technologies developed, it is difficult to easily switch to another path with different technologies. Inner-city transport is a good example: Electric vehicles and fuel cell cars need new infrastructure to provide the vehicles with electricity or hydrogen respectively. Once charging stations or hydrogen filling stations are built, it will be challenging for a new or competing technology to succeed. What strategies can guide us in such a situation to look ahead and take decisions responsibly? In the Trialog, the working group on path dependencies of the academies project “Energy Systems of the Future” discussed these and related questions with representatives from the public sector, the business sector and organized civil society. The Trialog report is available (in German) here. The first Trialog in the second phase of the project dealt with the topic of sector coupling and took place on July 11, 2017. So far the energy transition has been first and foremost a transition of the electricity sector: The share of renewable energies in the German gross electricity consumption has risen to 33 percent in 2015. In contrast, their share in the heating and transport sector is much lower with 13 and 5 percent respectively. Technologies in the electricity sector seem best suitable for providing carbon-neutral energy production on a larger scale. Therefore, electricity is expected to play a crucial role in the heating and transport sector in the medium and long-term perspective. The participants of the Trialog discussed amongst others the opportunities and limits of a further integration of the electricity, heating and transport sector. They also discussed in what cases a direct electrification seems most suitable and which alternative options exist in other cases (e.g. such as synthetic fuels). It was emphasized to make sure that the increased use of electricity actually leads to a reduction of CO2-Emissions. Finally, the participants mentioned a range of political and social implications that must be taken into account for a stronger sector coupling. You can find the Trialog report (in German) here.